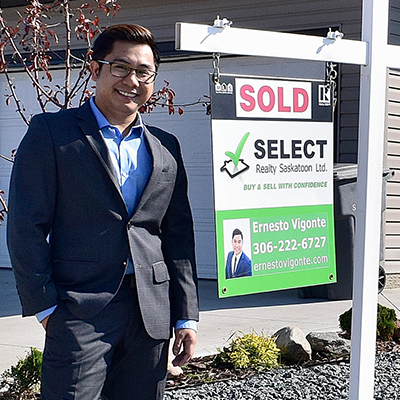 Hi my Name is Ernesto and I am A Saskatoon Real Estate Specialist! My story is like many Canadians residing in Saskatoon. I am an immigrant and started my journey as a realtor five years ago. When I came to Saskatoon, I enjoyed the fact this is a very diverse city. We have people from so many countries living under one sky peacefully and in harmony. Which is truly an amazing and rare sight and I am so proud to be a member of the great city of Saskatoon! Two major reasons got me into Real Estate business. What makes me good fit as a Realtor? Which is truly an amazing and rare sight and I am so proud to be a resident of Saskatoon! As an immigrant myself I found that all these newly landed Canadian and immigrants do not have required knowledge and guidance needed to purchase their first property. They are unaware of the processes. Having the experience of being on both side of the table as a buyer and as a seller, I learned that there is a gap that I can fill by being a real estate consultant to these new arrivals. As a new immigrant you are learning new things and settling into a new country is already a challenging task. I know we can all use tools available online to get educated on the home buying process. However, you have limited time available. I saw a gap that I could easily fill by guiding the first home buyers with my experience on the field and help them become proud homeowners faster! Reason#2 - The Art Of Negotiating! A good Realtor helps you make right investment, timely decision and is good at negotiating. Negotiating a house deal, whether you are selling or buying a property is by far my strongest strength and an asset for my clients. I am not scared to talk numbers with other party and help you make the best property investment. Everyone can look at data. However, a market expert can analyze the numbers a level higher than one not in the industry. I share with you insights, data, relevant stats and insights that you may not have figured out online. Plus, all of the research I do, I customize it based on your needs. By customize I mean that I crunch numbers, short list listings only which work best with your budget! Whether you are selling or buying a home, I make sure you the party I am representing gets the best possible deal. Yes, I make your preferences my priority. For example, if your preference is a nice big kitchen, I will bring those listings to your attention first. Another example, if your preference is to live in a quiet neighborhood, guess what I have been to all neighborhoods in Saskatoon and can tell you more! How do I know you are good at what you? I highly recommend you before selecting your real estate agent in Saskatoon please check out their reviews. You can click here to check my testimonials. Hiring A Realtor Comes With Strong Benefits & Higher Return On Investment.